I'm trying to copy/paste a bunch of Vietnamese text from a PDF document to Notepad++ (or anything, nothing works). The pasted text is different than the source text. What would be the best way to go about fixing this? Edit: It appears that if the source is a Word document it copies & pastes as expected. PDF is the issue here. It is because the encoding used in the PDF is arbitrary. "Encoding:Custom" probably means a (random seeming) encoding made up for it's own convenience by the program that produced this PDF. 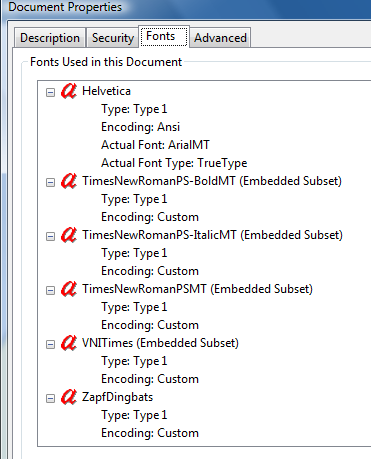 "Embedded Subset" means The program didn't need a huge number of characters from this font so it just picked the few it needed and arranged them in seemingly random order (maybe the order the program encountered them in the text) and the newly invented encoding is based on this ordering. Its not really "characters". Basically the PDF no longer has any universally meaningful information about "which character" it has. It just has an indexed bunch of shapes and a list of positions and sizes where it displays those indexed shapes. So you might try to see if it makes sense in say UTF-16 BE encoding. I found a solution that worked for me - though cannot explain why. When I opened the PDF in Acrobat, I was unable to copy and paste the Vietnamese characters. However, if I opened the PDF in the Preview App Version (I have version 5.5.3 (719.31)) on my Mac, I could copy and paste with no problem. Not the answer you're looking for? Browse other questions tagged pdf notepad++ character-encoding or ask your own question. How to convert a Persian pdf file to Microsoft word format?